The Mason-Dixon Line's history, replete with property disputes, persecution, and ideological conflicts, traverses our country's history from its founding to today. We live in a world of boundaries—geographic, scientific, cultural, and religious. One of America's most enduring boundaries is the Mason-Dixon Line, most associated with the divide between the North and the South and the right to freedom for all people. 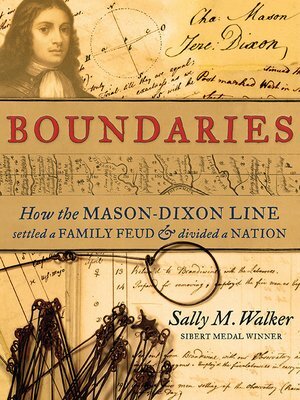 Sibert Medal–winning author Sally M. Walker traces the tale of the Mason-Dixon Line through family feuds, brave exploration, scientific excellence, and the struggle to define a cohesive country. But above all, this remarkable story of surveying, marking, and respecting lines of demarcation will alert young history buffs to their guaranteed right and responsibility to explore, challenge, change, and defend the boundaries that define them. Sally M. Walker is the Sibert Medal–winning author of Secrets of a Civil War Submarine as well as many other nonfiction books. She lives in Illinois.